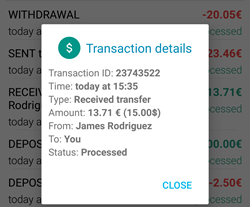 In the mobile main menu, choose Transactions in order to view transactions executed on your Moneymailme wallet. Note: In order to see all transactions on your Moneymailme account, you can always go to Transactions section on the web application. Tap on a transaction to see the following details: ID of the transaction, date and time of the execution, the type of the transaction, the amount and its status. 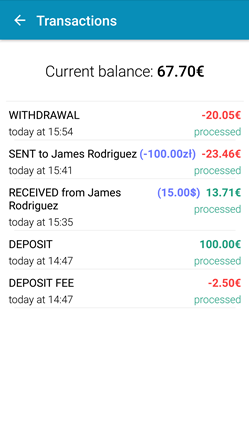 Following types of transactions can be processed in Moneymailme application: outgoing transfer (money Sent), incoming transfer (money Received), Deposit, Withdrawal, Fee. Following transaction statuses are available in Moneymailme application: Processed, Pending (for approval) and Rejected (request is denied). Tip: You can refresh the Transactions list by dragging it down. Tip: Tapping on a declined transaction will popup the reason why the transaction is declined.